My daughter was in from New York this past weekend. One of our favorite traditions is to dig for buried treasure in the Heart of Ohio Antique Center. It's the largest in the Midwest with over 650 dealers and takes a good four hours or so to walk through, even at a quick pace. So Saturday, we hopped aboard the old green Land Rover, accompanied by gorgeous N.C. Wyeth skies. One of my finds, was a mod little 7 1/2 inch vase. 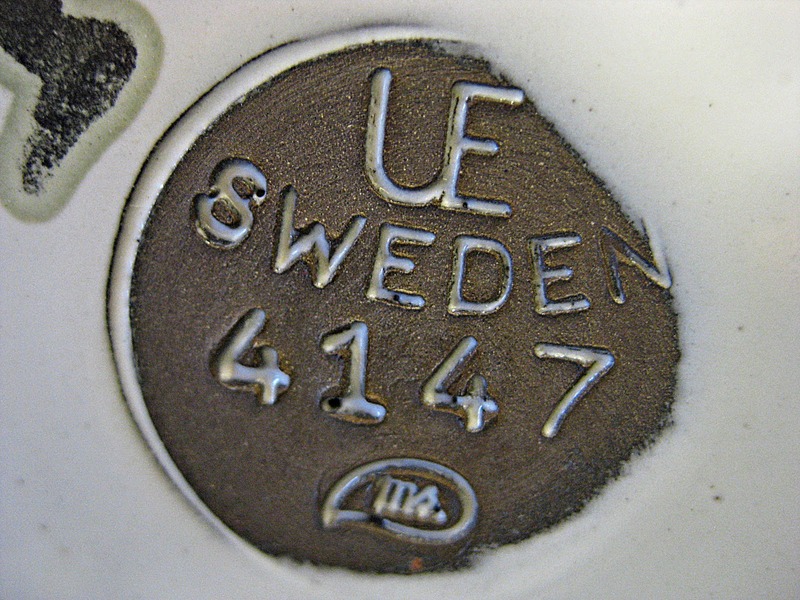 It was stamped UE Sweden on the bottom with a serial number and initials: a juicy story just begging to be investigated. Did I comply? Of course I did. (I love her quirky Picassoesque style. My sleuthing turned up some fun results. The "UE" stands for Upsala-Ekeby, founded at the turn of the 20th Century in Uppsala Sweden. The company produced artistic ceramics from 1920 until 1973 when it was sold and subsequently closed down. 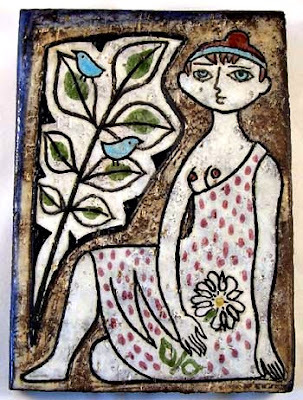 Several important Swedish Modern artists worked at Upsala-Ekeby including Mari Simmulson, Anna-Lisa Thomson, Ingrid Atterberg, and Vicke Lindstrand. The initials "MS" on my piece stand for Mari Simmulson, a potter and artist, born 1911 in St. Petersburg, Russia. Educated in Tallin and Munich, she started her career at AB Gustavsbergs Fabriker in 1945. 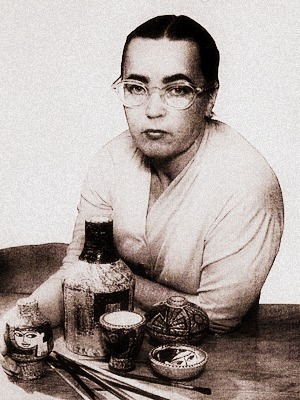 Between 1949 and 1972 she worked at Upsala-Ekeby and became a Swedish citizen in 1952. An extremely creative artist, her work has been featured in public art displays in Sweden and Copenhagen and is represented in museum collections all throughout Europe. 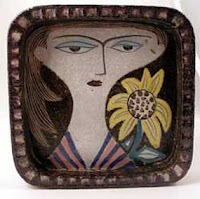 My little Mari Simmulson 1950s vase? An exact match is online for $200. I paid $14 and consider it a great investment in keeping company with art. You are such an inspiration ... I tip my hat to your perseverance and thriftiness. My daughter and I are still searching for the "jackpot" find... but I think I enjoy the time spent together (and the Starbucks coffee we grab on the way). ...it is a gorgeous find by the way. Boy, you'd love our 'boot sales' over here. You'd need a shipping container to get all the stuff back!! Margaret, time with my daughter is always a cherished treat! Loved your sleuthing. It's so much fun finding an item in a thrift store only to find out it's worth 10x the value I paid. That's the fun in shopping second hand for me, the find. Cro, prepare your guest room. I'm comin' to boot! Most interesting - and love the patterning on those owls. Dom, now that you mention it, it does have very sensuous lines. Very feminine, very corset-ish. and I'm glad you got to spend time with your daughter. My oldest is going to be staying in Boston for the summer instead of coming home and I haven't quite gotten used to the idea yet. What wonderful find, your trained eye knows when it hits a treasure! You are a master treasure hunter. What a fantastic find. You are a master sleuth! I love the shape of the vase and the unusual oval opening. I really like the way the black lines are etched to look like spider webs against the solid black & white. Very unique and beautiful pattern! 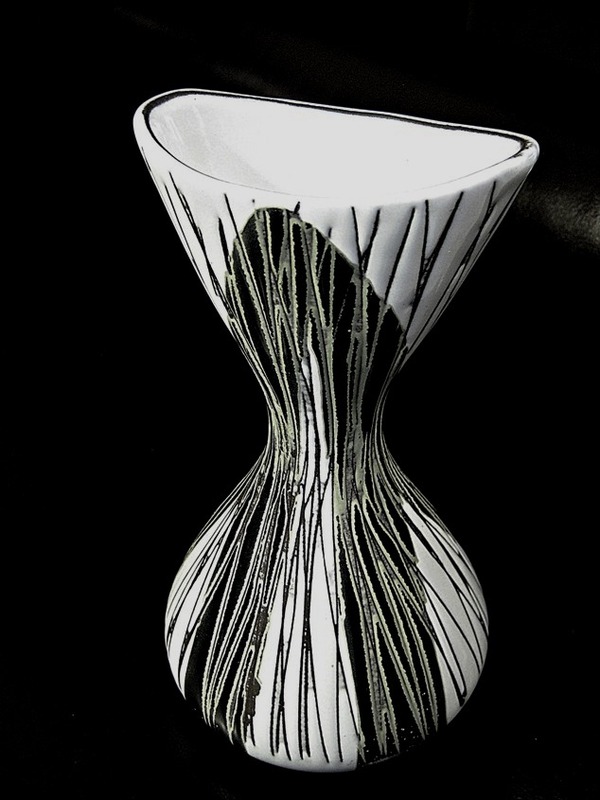 The vase is brilliant...a true bargain. The research wasn't wasted as it made fascinating reading. Thank you. "Keeping company with art" -- that sounds like a poem/essay/book in the making. Loved the stroll through your collection & findings, Tess! Good find, Tess. But if you keep collecting you may have to add a wing or two onto the Manor! Catalyst, I'm pretty good at recycling. I give away a lot of stuff to friends, family and my local Goodwill store. It's the circle of art. Enjoyed the story and the recognition of the artist. I love those owls - I remember similar ones from my childhood. Oh, I like her work! Excellent find, and what fun that your daughter could join you, Tess! 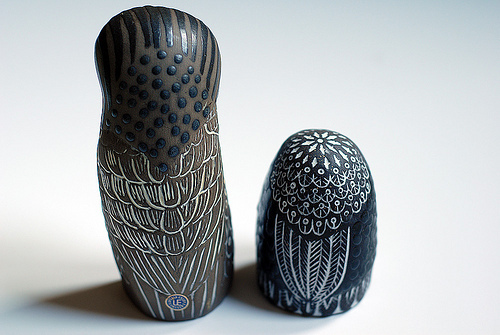 The owls remind me of the matryoshka dolls of Russia. Go figure. Your good eye and your nose for a bargain strike again! Love the back story and I want one of the lady pieces. Like the time I found a beautiful Hull jardiniere with hand-painted iris on it's glossy brown surface...and in Good Will to boot...$4.00...I 'bout choked...worth $350.00, sleuthing is good!!! Wonderful find! Rel, the owls remind me of the Russian matryoshka dolls, as well! You find the best stuff ever. As you know such sleuthing, such searching for the back-story, such following the digital threads, is one of my great interests in life. Of course you knew. Great eye, Tess! Like I said in a previous post, I'd like to go antiquing with you. We might have to fight for "first position" though so many it is better that you go by yourself! :) I found a print at my local Salvation Army that looks "promising" but I can't seem to find anything about it because the name on the print is so hard to read. Any ideas on how to decipher obscured names? Agent Kincaid, you've done it again. You are an inspiration to the rest of us in the CIA,FBI,KGB,and IRS. Teri, I use a big ol' magnifying glass. But sometimes those names are just too difficult to make out. Hope you solve your mystery! It reads like you had great fun! Thanks for sharing. A great find and a great blog post! good detective work! and you obviously have a great eye for stuff. Another fascinating read - thank you. Love that vase. yes, great find and wonderful art sleuthing! can see how that little vase captured your heart and eye! i love hunting for treasure with my daughter too!